The placement cell of ITRC has been developed for providing job assistance to our students. The placement team is in constant touch with prospective employers who are in constant need of fresher. ITRC Placement cell also invites corporates to conduct in campus recruitment drives for its students. 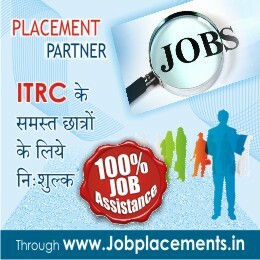 Thousands of ITRC pass outs are working in companies like HDFC, AirTel, Future group, Bharti Axa, Reliance communications, Idea Cellular, Wipro, HCL, IBM, Satyam Cinema, Big life, Sundaram group, SBI, ICICI ,Railways,CRPF,NMDC,first source,etc.Many working employees are also undergoing training in various programs for improving their skills for better career prospects. Placement cell also provide assistance to such students in their career improvement goals.